We love hearing stories of triumph! We love it when an underdog – literally – proves not only to be different than assumed, but to go above and beyond expectations. I’m sure we’ve all heard many stories of Pitbulls who overcome stereotypes and victoriously prove their goodness. This breed that gets so much put up on them, so much false baggage which they must carry around like a heavy weight, bearing it anyway so they can show you their love. What will it take for more people to believe that Pitbulls are wonderful? We at Adopt-a-Pet.com never get tired of hearing another tale that tears down the misconceptions of Pitbulls! Check out Scooter’s story here and read about a dog who was used to intimidate, but ultimately cast aside for her unwavering sweetness. That is until a fabulous rescue came to save her! From “thug” to therapy dog in training, Scooter is soaring past limitations and surprising everyone with her abilities. Photo: Courtesy Born Again Pit Bull Rescue. 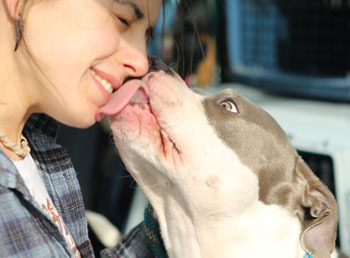 Scooter, who loves to give kisses, licks Merissa Micochero, who fostered and trained her. Thanks to Micochero, Born Again Pit Bull Rescue and Scooter’s new owner, she has a new leash on life. So many of you are heroes out there doing the same – looking beyond breed and judgments, pushing aside hype and fear, looking into the eyes of a dog and seeing their truth. We thank you for helping pave the way for Pitbulls everywhere, and we applaud you for showing them to be who they really are! All dogs are individuals, unique unto themselves, and dogs like Scooter remind us that love knows no breed or boundary. If you rescue Pitbulls, foster or have adopted Pitties, we thank you for the work you do to help us celebrate these marvelous dogs!